7 people live in a seven storey building (numbered as ground floor= 1st floor,1st floor =2nd floor and so on) . They are watching seven different Movies at the same time – Sultan, Golmaal, Padmavaat, Bajirao Mastani, Haidar, Arakshan, Feluda. S lives immediately above the person who watches Golmaal. There are two persons between B and the person who is watching Feluda. Q is watching Arakshan and lives between P and C. P lives two floors below S and neither watches Sultan nor Haidar. D lives on the topmost floor but neither watches Sultan nor Bajirao Mastani. The person who watches Bajirao does not live on any even numbered floor. Only R lives immediately after Feluda. 2. How many people there are between Q and B? 4. Which one is true? 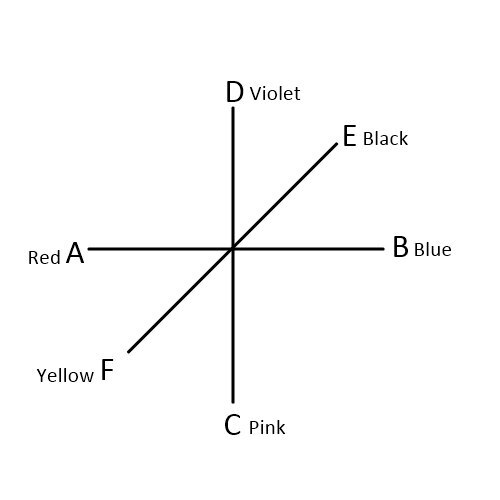 6 people are seating on a circular table- A,B,C,D,E,F. They are wearing t-shirts of 6different colors- Red,Yellow, Blue,Black,Pink,Violet. The person who is wearing pink t-shirt ,is not the neighbour of D and seating opposite to a person who is the neighbour of E who neither likes Blue nor Violet. C is seating second to the right of the person who is wearing Red t-shirt. Neither Blue nor Black t-shirts are the neighbours of A. There are two persons between E and F. The later is wearing Yellow t-shirt and seating on the immediate left of C.
6. Which one is true? 7. Who is in between B and F? 9. Who is on the immediate left of A? 10. How many people are there in between A and B clockwise ?